GUANTANAMO BAY, CUBA—Applauding and cheering as news spread that their beloved, longtime home had been saved by executive order, the inmates of Guantánamo Bay celebrated Thursday in a spontaneous outpouring of both joy and relief. “President Trump really came through for us, my brothers—he saved the one place we’ve ever truly been able to call our own!” said 16-year prisoner and former Afghani herdsman Ghassan Abdullah al Sharbi, one of the dozens of men at Guantánamo who have been imprisoned without warrant, interrogated without restraint, and due to recent opposition, faced the possibility of having to leave the war prison where they have spent so many of their formative years as detainees. “I was worried the ACLU or Amnesty International or even the previous administration would close this unique place where I’ve spent nearly half my life and made some great friends, but now I get to stay right here. 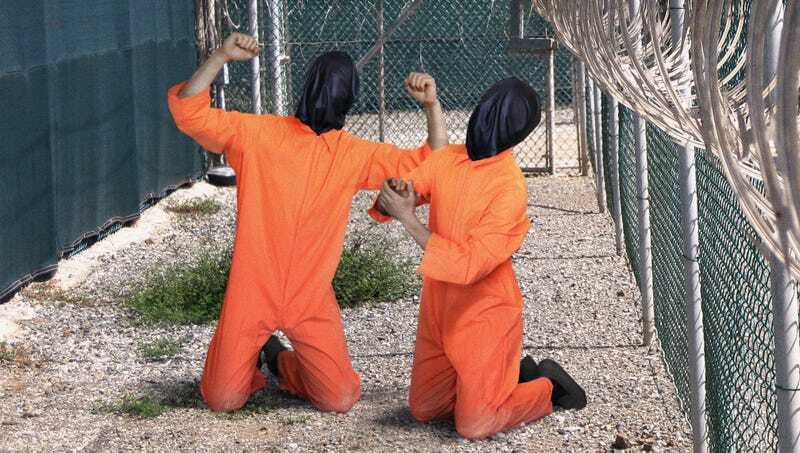 Thank you, President Trump—it’s people like you that reaffirm everything I believe.” At press time, the residents of Guantánamo Bay were holding an impromptu “block party” during their weekly 15 minutes of outdoor time.